Remember, click on the picture to read the lettering. 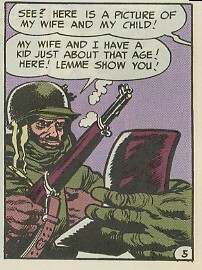 How many times have I told you that Harvey Kurtzman created MAD comicbook? I believe more than once. Many. For the first 23 issues he was the editor, sometimes cartoonist, and he wrote every story. Before MAD, EC Comics also had a big array of horror and science fiction titles. 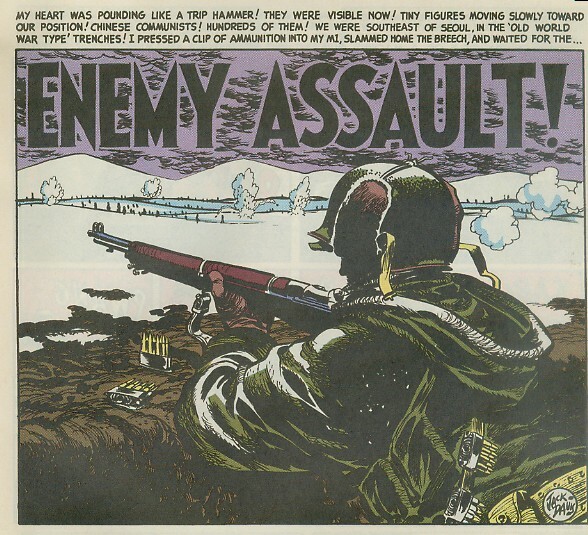 It also had two war titles: FRONTLINE COMBAT and TWO FISTED TALES. 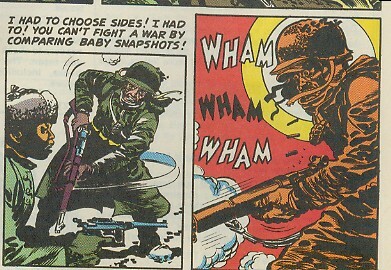 The two war comics were also edited by Harvey Kurtzman in the same way he did MAD. He wrote almost every story, with a few exceptions, and occasionally illustrated a story. 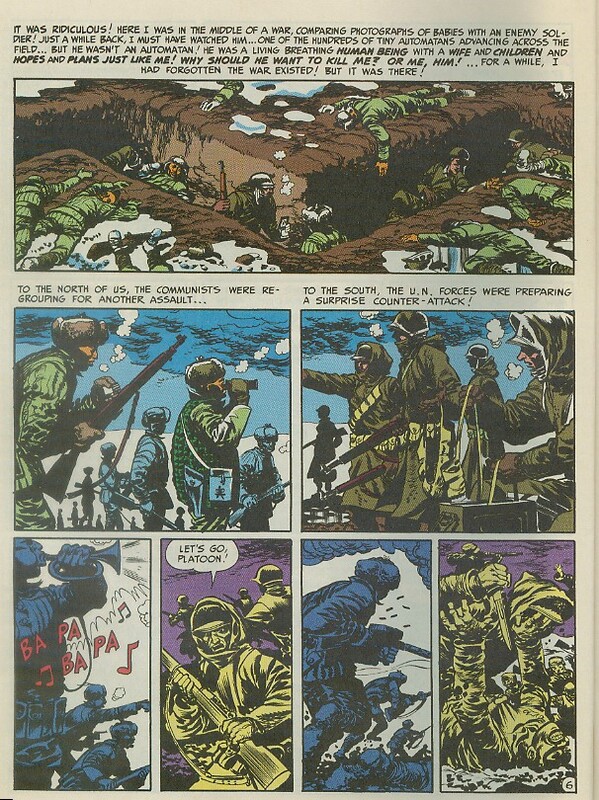 The war comics were produced during the Korean War, and a good deal of the stories were from that war. But there were also stories about the Civil War, World War II, World War I, the Revolutionary War, Romans Wars, and other historical wars. 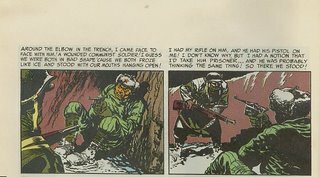 Kurtzman insisted on accuracy. The events in the stories were historically accurate and so were the uniforms and weapons. 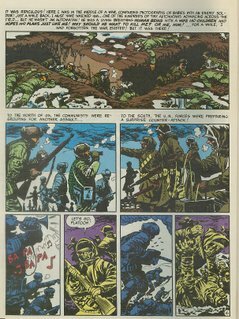 Unlike other war comics of the day Kurtzman did not glorify war. He over and over illustrated that War Is Hell and the good guys don’t always win, in fact the good guys are not always good guys. I think a good example of how hellish war is the story ENEMY ASSALT! in the first issue of FRONTLINE COMBAT. It is illustrated by Jack Davis. It is about the Korean War. It is told from one American soldier’s viewpoint. He and his buddies had face to face combat with the enemy, the North Korea Communist soldiers. After the smoke clears just he and a Commie soldier are the only ones that survived. There are bodies all around them. They each have their gun aimed at each other, each wanting to take the other as a P.O.W. The G.I. realizes the Korean can speak English. After they talked the Korean tells him he worked for a wealthy Korean who had an apartment in New York City and he was a servant. The G.I. said he went to NYU and as they talked with their arms trained on each other they found out they lived only a block from each other in NYC. They probably saw each one time or another. They pulled out their pictures and showed each other pictures of their wives and children. They both saved money and each bought a farm. They had similar lives. What they did not know was that each side was approaching the long deep trench for another fight. A fellow G.I. made his presence known and the North Korean he had been talking to turned to shoot the American intruder. 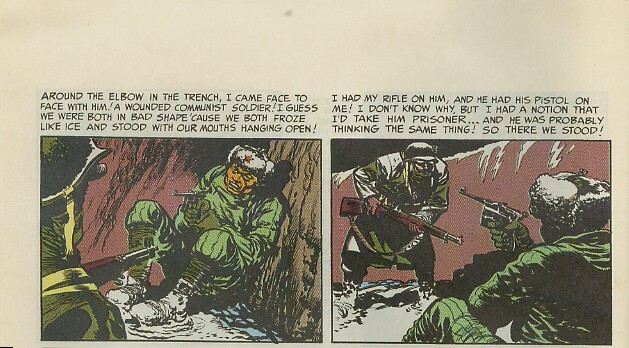 Instead, the first person G.I. shot and killed his new friend. Thx Ed. Hope ya don't mind if I link to this post when I get home tonight. Those cartoons are very interesting! It's something how war has a deep rooted "sameness" about it, and yet the changes of how it's carried out are so different. Same old story. Soldiers try to kill each other. Played and replayed over and over throughout time. Sad... because they are just going by a president's decision who hid in the shuffle of the National Guard paperwork.